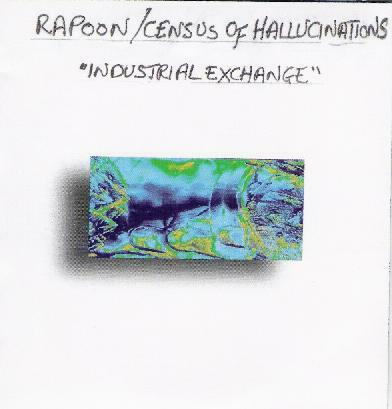 Rapoon / Census of Hallucinations - "Industrial Exchange"
The underground music scene is a wonderful place for numerous reasons, one of which is that the unlikeliest of collaborations needn't come as a surprise to anyone. Robin Storey was a founding member of Zoviet France (1980-1992), and since 1992 has been recording under the Rapoon moniker. Census of Hallucinations, who regular Aural Innovations readers will know, are the space-psych-progressive song maestros headed up by Tim Jones & Terri~B of Stone Premonitions. The music on Industrial Exchange will be more of a surprise for Census of Hallucinations than Rapoon fans. Robin took existing Census of Hallucinations songs and did his sonic manipulations on them to create a very nice set of ambient/sound-art/experimental excursions. Among the pieces that caught my attention are the title track, which conjures up images of being out at sea on a dark foggy night. I like the repetitive pattern to which Robin adds foghorn like blasts and vocal bits (I think they're voices? ), and a nifty noisy ending. "Alien Drill Regenerator" is like a groove tune designed for a factory setting. "If At First You Don't Succeed" is the most overtly groove oriented track on the album, this one being a full blown avant-dance tune. At over 11 minutes, "Amalgatron" is the longest track of the set and one of the instances where I thought I could detect the original Census of Hallucinations samples, in this case Terri~B's voice, which Robin skillfully incorporates into a multi-layered voice, rhythmic pulse, guitar and noise/sound blend. LOTS going on here and a track that reveals something new with each subsequent listen. Ditto for "Eyeing the Third", which has a sort of avant-garde Enya vibe. "Pollutician" is certainly recognizable for Tim's 'I am a politician' cry from the Census of Hallucinations song, "Lie Again". And I could hear Tim's distinctive guitar licks on "Slide Rule Calculation", which goes very nicely with Robin's sound manipulations. Overall, an enjoyable set and a very interesting listen, especially given the nature of the collaboration. For more information about Rapoon visit: http://www.rapoon.net. For more information about Census of Hallucination visit: http://aural-innovations.com/stonepremonitions.